There's a scout in the troop that just finished eigth grade this spring. In the 3 years he's been involved in the troop, he has advanced only to Tenderfoot. On paper, some folks might say he's "failing", or at least not "getting" the scouting program. Far from it. I just had a scoutmaster conference with him today to check in and see if I could help get him through some requirements. We chatted about our week we just completed at summer camp and I told him it was pretty cool that he earned the NRA Marksman First Class award. He also completed the Rifle and Shotgun merit badges. He had a great time at camp. This scout actually has a great time at pretty much every scouting event he attends, and he attends a lot. So, you would think he'd be advancing more. When I asked him what his plans were for reaching the higher ranks, he told me he wasn't really interested in that - he just liked scouting. He wants to keep having fun with his patrol and doing the fun stuff that the troop plans. And, I guess, that's hitting the nail on the head right there. A scout does what he enjoys doing and that's what keeps him involved. Some scouts thrive on badges, pins, and ribbons while others just like burning stuff and skipping rocks. As long as they are having a good time and getting what they need from their troop and patrol, it's all good. They will be learning good stuff without knowing it. Some enjoy being up front leading but there's room for those that mostly follow along too. Those followers may not demonstrate what's required to be an Eagle, but they can certainly contribute to their patrol. We did discuss the fact that he will need to reach First Class to attend high adventure trips next year and he has created a plan to advance that far. He's actually done practically everything needed, but just doesn't ever get his book signed. He isn't lazy or forgetful, it just isn't a priority for him. He told me directly that he is not interested in being an Eagle scout. All the work of a project and leadership roles and mandatory merit badges does not appeal to him. If he reaches Life, I'll be very surprised. But, I won't be surprised to show him out the door on his 18th birthday and right back in again as an Asst. 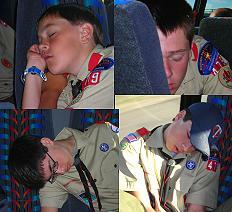 Scoutmaster the next day. I need to keep in mind that every boy that comes along to join Boy Scouts is unique but every one wants to have fun. Each one has potential to accomplish great things and I just need to follow him along his trail to see how it goes. There's nothing wrong with him stopping for a bit to rest or just to blow dandelion seeds for the heck of it, as long as we're enjoying the trail. As long as he and I understand where he wants the trail to take him, I can nudge him along if he wanders too far off. Not every scout's trail is headed towards Eagle. Here is a news snippet about the All Things Emergencry Response that I helped with last week at Many Point. My role was to present the Wilderness First Aid Basics training so the 14 participating scouts could receive their certification. The participants also earned their CPR certification and completed a few merit badges, but I didn't get to be part of that - I had our troop to enjoy for the week also. This program was excellent. The scouts got to work through staged accidents for bicycles, automobiles, planes, burning buildings, water and ice, explosions, as well as general wilderness scenarios. There's nothing like a nice long bus or plane ride to start the recovery process after a Philmont Trek. I was expecting a lot of chatter and excitement, but as you can see it was a pretty quiet trip. We had a 6 hour drive to Denver from Cimarron and then a 2 hour flight to Minnesota. For the most part, there was sleeping with some talk about where everyone would eat 'real food' as soon as they got to Denver airport or home to Minnesota. One productive thing that did get taken care of on the way home was having each scout complete a High Adventure Feedback about their trek. This provided some great input for our future treks and areas for the crew leaders to consider working on their leadership skills. I'd highly recommend a similar review of any high adventure trip. Now that the 17 scouts are rested up from Philmont, 15 of them are off to summer camp on Sunday. No rest for the weary. Hmmm, maybe we'll see another bear. On our 84-mile Philmont trek this year (trek #32), we noticed that the food we received was quite skimpy. Our ranger mentioned that breakfasts were especially light this year and I noticed the same thing since my 2005 trek. I calculated calories from the packaging and it looked like breakfast was around 800-900 calories, lunch about 1100, and dinner was impossible to figure out since there was no calorie info on the packages. I figure dinner was around 1000-1300 calories. A 150lb person requires around 2000 calories per day for normal activity. The activity level in camp at Philmont is much more than 'normal' with all the extra work to gather water, participate in programs, and walk to and from your campsite. Add on about 100 calories per mile hiked and you easily go over 3000 calories. The addition of a 40lb pack requires more calories. Whether doing a trek of 55 or 85 miles, crews receive the same amount of food for meals. That extra 2 miles per day costs more calories which is not replaced. Our ranger had told us about the swap boxes at staffed camps. He said they were for exchanging food they did not want for food they did want. Trying to follow the rules, since they had consistently eaten all their food, scouts were passing by the swap boxes. By the 4th day, we had some fairly hungry scouts. Hungry enough to figure out that walking past food instead of taking it and eating it did not make sense. From then on, they often did the swap box sift, checking for more to eat whenever possible. We were probably one of the few crews that pulled out and ate things like mashed potatos and corn rather than the normal gorp, pineapple, raisins, and other sweet stuff. Don't get me wrong. I really enjoyed the Philmont food. I lost a few pounds, but had enough to eat. The scouts learned a bit about taking opportunities when they crop up and making due with what you have and not wasting anything. I squirreled away some food items during the end of our trek and brought them back to the troop. At our Court of Honor the day after we got home, the younger scouts got to see what we ate and got to sample gorp, Santa Fe trail mix, jalapeno squeeze cheese, jerky, apricots, pineapple, and other assorted items. This was a really good way to start them thinking about their Philmont trek since we'll be starting that process in just a couple months. For your Philmont trek, consider the size of your crew members. A 200lb scout gets the same meal as a 100lb scout so crews should be prepared to check that everyone is getting enough. Also consider the length and level of your trek. 10 miles a day burns more calories than 6 miles a day, but the meals are the same. One more thing, weather will play a part in calorie needs. Cold weather requires more calories to stay warm at night while hot weather requires more water but less calories. Just got back from Philmont last night and wanted to share this picture right away. There really ARE bears at Philmont! Our crew ran into this bear in a ravine with a creek in the north country around Pueblano - one of the dwindling wet areas for wildlife to get water. 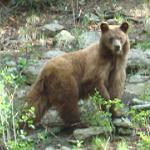 We were hiking up the trail when the lead scout saw the bear about 20 yards ahead and hollered "BEAR!". Of course, the excitement level went WAY up, but the bear just moved along the far side of the ravine while we waited. Once he was well off the trail and across the ravine, we continued on. I was invited to lead the hike for the next mile or so. :-) About 10 minutes before this, I had commented that it sure looked like bear country with the water, shade, and plants. Our second crew also got to see a bear in the Hidden Valley at the end of their trip. We heard reports of quite a few crews seeing bears this week as well. There'll be more Philmont posts over the next few days as I work my way through the photos. This morning, I'm in Colorado Springs on my way to Philmont with 17 scouts and 5 other scouters. We have the opening campfire tonight and on the trail tomorrow so I'll be offline for the next 2 weeks. On this trek, we're trying out a new gizmo called SPOT Messenger. Take a look at it at http://www.findmespot.com When we return, I'll post a map of our route using the waypoints it tracks. The parents of our scouts have a link they can visit to see our daily progress. If you want to check on us, visit Our Progress over the next days. I know you have them in your troop, too. A few guys that just love to set up, light, and then play with the fire on every campout. For these guys, a fire can never be too big, too hot, too smokey, or too much fun. Last weekend, we had one scout that squatted by the fire with a long stick for at least two hours while dinner was being prepared, eaten, and cleaned up by his patrol. He did take a break to grab some food, but that was it. Of course the stick didn't stay in the fire the whole time. He spent his time prodding, poking, and stirring the fire - in his own little world, enjoying every minute. I've learned that these scouts are often not the outgoing natural leader types. More likely, they are quiet and curious. And, they tend to have more patience than others. So, to challenge them with an obvious reward, I bet them that they can't start a fire using some primitive means - flint & steel, fire piston, magnifying glass, bow drill, or whatever. The reward is that they get a great fire to play in and I might sweeten the deal with getting to be first for making their dessert burrito or other snack. Next summer, the PLC has planned a 'Wilderness Survival' campout and I'm hoping they will include primitive firestarting as a skill - no matches or lighters, and no fire means no hot food. Our troop has a selection of firestarting methods for the scouts to practice. The Sparks Fly flint & Steel sets are really great kits for learning to make fire (they're $17/each for a dozen). Our scouts have had good success in making their own charcloth and then lighting it with sparks they make. Only a few skinned knuckles along the way. If you've got pyro scouts (and I know you do) rather than constantly pulling them away from the fire, why not have them strengthen their skills by trying different firestarting methods? It was sad and scary to hear about the tornado deaths at the scout camp in Iowa tonight since our eldest son is off to Boy Scout camp for the summer. From the news reports, a scout leadership camp was underway so those scouts that were there would have been the best to handle the situation, assuming they were their troop leaders. I'm sure more details will be broadcast tomorrow and following days. Our son is the Handicrafts Director at Many Point Scout Camp for the summer. He'll be there for 10 or 11 weeks, having a ball, but dangerous weather is always a concern. It's rare to go a full week at camp without at least one fairly severe storm - in a summer, the staff usually get hit quite a few times so they need to stay on guard. Weather Hazards Training will be mandatory for at least 1 adult leader on every tour starting on January 1, 2009. The online training is available now and it would be a great idea to complete it as soon as you can - especially before your next trek, trip, or campout. Scoutmaster Adam Hansen of Troop 421 chartered to the LDS - San Antonio 8th Ward - North Stake won over $250K on Deal or No Deal tonight. Congratulations to Mr. Hansen on his winnings! The show seemed interesting enough for me to watch when I happened to see a preview showing a man in a scouting uniform. Mr. Hansen seems like a nice guy and wound up doing very well on the show as far as stopping at the best time, taking the money, and getting out. I was very surprised when the MC, Howie Mandel, challenged Mr. Hansen to wear his scoutermaster uniform to continue the game and he came back after the break with it on. From the insignia, it appears to be his official uniform - red shoulder loops, World Scouting emblem, US Flag, "Boy Scout of America" over the pocket, Alamo Area Council shoulder patch, and 421 troop numerals. It even had a BSA neckerchief slide. So, I figure it's really his uniform. Wear the uniform for Scouting activities and events. "Deal or No Deal" is hardly that. Scout uniforms are not worn to political events or rallies, protests or demonstrations where its appearance could reasonably be used to imply BSA support for a particular political cause or candidate. I guess "Deal or No Deal" isn't political. Uniforms are not used to promote a commercial product or business except as approved by the National Executive Board. Hmmmmm. Did this scouter get approval from the BSA to wear his uniform in the hopes of getting Scouting out in front of the public? The show was filmed in California and he came all the way from Texas, so I don't think the uniform was a surprise to him - it was probably brought along on the plane. Did he just collaborate with the show's producers and they came up with all this Scouting theme, or were higher-up BSA folks involved? With the marketing drive going on for the upcoming 100th Anniversary, I wonder if we'll be seeing more 'exposure' like this to get Scouting out to the masses. If this wasn't planned by the BSA, I wonder if any reprimand will be waiting for that scoutmaster when he gets home. With $260K+, he probably doesn't care too much, but it would be interesting to hear. As you can see in the picture, the models were also dressed up in scout-wannabe outfits. If you look closely, you can see that they are not official uniform pieces at all. There were no emblems except for the troop emlems which matched each girl's suitcase number which I thought was clever. I did notice that the scoutmaster patch on the contestant's uniform was sewn onto his right pocket instead of on his sleeve - weird. I've never seen that one before. One thing that did bother me watching the show was continually mentioning "for the boys" as if the contestant was raising money for his troop. I believe the MC, the contestant, his wife and brothers, and even a model used the term. But, when discussing uses for the money, all I heard was "new house". Well, maybe the scouts will get new tents or something cool. Have you heard of the BSA's Open Source Initiative? Huh, me neither. But, after a 6 month development effort, there is a web site with a goal of being an Open Source Software resource for scouting units. The main purpose is to help the Open Source community and the Scouting community work together to create software to meet the needs required to support the activities of Scouting. These needs include the management of volunteers, fundraising campaigns, and events which individual units now figure out and pay for on their own. With access to a library of solutions, the effort and expense for individual units should be minimized. This initiative could drive huge changes within the national and local BSA organizations. If it takes off and gains support, there may be many useful tools created. On the other hand, if it turns out to be just the dream of a few geeks in the national ISD (Information Systems Division) of BSA, it may be nothing. I'll be keeping an eye on it just to see the evolution over the next year or so. The Boy Scouts of America are searching for a place to call home - or at least for the National Jamboree to call home. The Jamboree has taken place the past seven times at Fort A.P. Hill in Virginia and will be there again in 2010, but a permanent, BSA-owned facility is the goal as part of the big 100th Anniversary push. From the requirements, I'd place my bets on land somewhere in Utah, probably just west of Salt Lake City. The hope is to have all proposals submitted by July 11 and a site chosen by the end of 2008. The next National Jamboree would be held there starting in 2013 and the facility would be a permanent site used for ongoing leadership development programs and high adventure programs. Maybe even a future World Scout Jamboree could take place there.